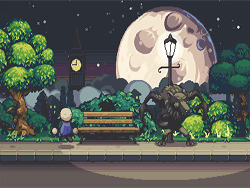 The game Werewolf Tycoon is a pixel wind RPG game, the game players will predominate a Werewolf attacks on humans in the park. This game is full of pixel wind style, looks very mischievous and black humor. Game, players must pay attention to the don’t be found by other humans, if you be found, you will be driven. You should be good at hiding and act quickly . If you like this kind of nostalgic style of the game, try to experience, the game screen is also very funny and can shock your head. If you interested in this game, Let's have a try. You can play Werewolf Tycoon free online car games at fogames. It has tags: Army,Adventure,Action,Monsters,. It has 3279 total plays and has been rated 84.8% (16 like and 2 dislike), find the fun and happy day. If you want to play more car games, we find some of the game: Idle Web Tycoon, Fishtopia Tycoon 2, Halfling Tycoon and Fishtopia Tycoon. To play other games, go to the army games page, the adventure games page, or just check out the new games or best games page. Play Werewolf Tycoon online games, Fun and Happy.